Moc Chau Son La has long become a popular destination in Vietnam for visitors, because not only beautiful natural scenery, but also many interesting attractions. Especially among them there is Dai Yem Waterfall - a beautiful waterfall in the pine forest in Ban Ang village. Visit the Dai Yem waterfall, hearing the story of the meaning of the name of the waterfall, visitors will feel their trip is wonderful. 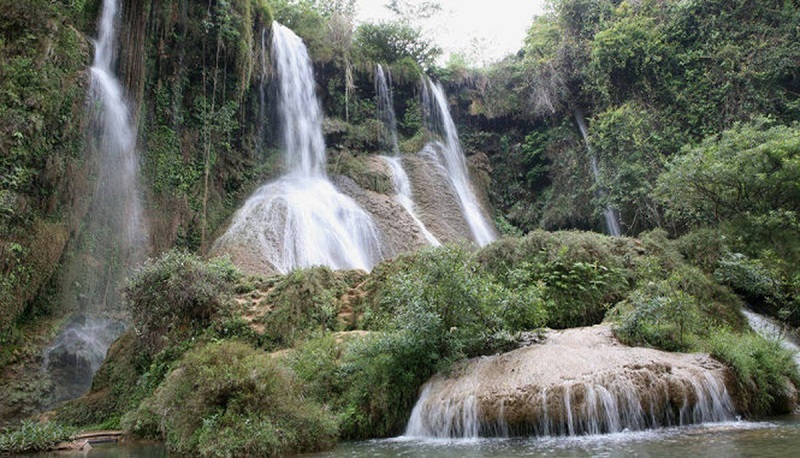 Dai Yem waterfall (another name Ban Vat waterfall) is situated in Muong Sang commune, Moc Chau district, Son La province. From the town center, go ahead to Son La, then to three-way intersection of Long Sap border gate then turn left to 43 road. From here, it is about 5km to Dai Yem waterfall. In order to access this cascade, you have to walk through the woodlands and across a small concrete road until you see Dai Yem Waterfall. 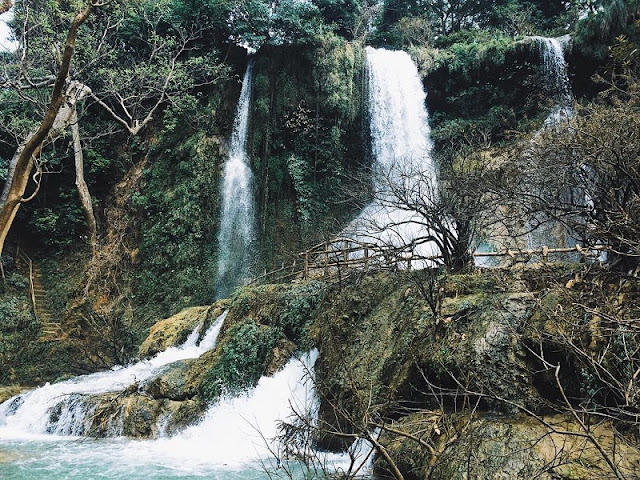 On the way to Dai Yem waterfall, you will catch many beautiful landscapes of highlands, friendly smiles of the locals and feel the breath of spring full of energy. Two springs Vat and Bo Sap merge each other and then pour down the karst area to create Dai Yem waterfall. The water is also associated with a legend of the bodice of a girl who rescued a guy from the flood. The waterfall is described with the height of 100 meters, divided into two branches, one with 9 steps (that symbolizes for “nine steps of love” in the legend) and the other with 5 steps. The two branches of the waterfall are about 200m apart. There is a flat area in the middle that make convenient for sightseeing and photo taking. Dai yem waterfall also called Ban Vat by local people is a historical landscape, which is close related to the inhabitant history of Thai people in Muong Sang land long time ago. Anyone who has visited the site will surely be guide tour told the source of the waterfall. It's a beautiful love story but it ends sadly. The story of a couple who are orphaned by their parents, live in a village near the falls, grow up in love with each other. Until the day, the son had to help Laos fight the enemy should temporarily break up with the girl. Where two break up is the peak of this falls. The boy left, the girl stayed still keep the promise of loyalty waiting for her lover back. Years later passed. When everyone went that same year back, the girl still did not find her lover. Still brings hope, every day after the field work is done, she is at the top of the tower to the flag for her lover to return. Until that afternoon, a heavy rain came to causing the overcast of a forest. When the blue sky came back, people in the village no longer find the girl, people just see a bib is caught on the tree branches at the top of the falls. To mourn for the girl as well as admire their beautiful love from which the people also named the waterfall is the Dai Yem Waterfall. It can be said that Dai Yem Waterfall brings a charming picture. It is favored by the nature and becomes a gem of Moc Chau Plateau. The most important thing is that it retains majestic wild characters. If you have a chance to visit the plateau, do not miss this waterfall. Its name has become more and more popular when it leaves a deep impression about such beautiful, dreaming and attractive waterfall.